Nutrition is one Essential you may consider every year as part of your New Year’s Resolutions. Revolutionize your Nutrition – make it a joyous “live-it,” instead of a dreadful “die-it”! You read here last week that you are designed to be healthy. Your body is a self-healing organism. You were meant to live in health and die in health. It is possible! Your body was designed to process the nutrition from real food. In real, whole, natural food, you get a rainbow of nutrition from varied sources in all the colors of the rainbow (and more). Real, whole foods contain micronutrients as well as the commonly known macronutrients of protein, carbohydrates, and fats. 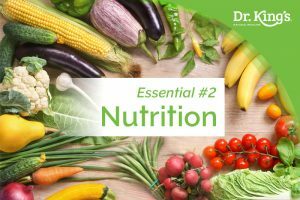 Vitamins, minerals and enzymes, as well as phytonutrients (plant nutrients) are essential to proper, healthy functioning. Here are a few “nuggets of nutrition” to consider. Unlike impoverished nations and certain generations, most people in developed countries have plenty of food all year ’round. Still, we are undernourished, lacking the life-giving essentials of real, whole foods, while killing ourselves with vast quantities of synthetic sweeteners, adulterated fats, additives, preservatives, genetically modified organisms (GMOs), pesticides, herbicides, antibiotics and hormones. Western people are malnourished by high calorie, high chemical and low nutrient diets. Childhood obesity is perhaps the most tragic part of this epidemic. Researchers predict that children today can expect a shorter lifespan and poorer quality of life than their parents due to unhealthy choices. Type 2 diabetes, once known as “adult onset diabetes,” is on the rise for people of all ages. Shockingly, obese children are now being diagnosed with type 2 diabetes. Imagine having type 2 diabetes at 15 and looking forward to – not a world of bright opportunities – but heart surgery, blindness, amputation, kidney failure and blood transfusions. Is this the death sentence we want for our children? The study of epigenetics revealed that our human genes can be switched “on” toward healthy expressions and turned “off” from diseased expressions, even if we were born with predispositions toward that disease. With this knowledge, the entire paradigm of genetics was upended. Just because your ancestors had this or that disease doesn’t mean you are destined to develop it. Much more depends on how you live your life, day to day, not what genes you inherited. We now know the importance of keeping our gut microorganisms healthy and happy with natural foods. The Eight Essentials from the book, The Healing Revolution, will guide you (and your families) on the path to a long and fulfilling life by redefining and rediscovering amazing “real” food, and the joy of being truly nourished on all levels. Whole-food nutrition feeds your life force. Buy and eat whole, natural foods – eat a rainbow! How many colors can you eat this week? Cook your food in a small amount of water, then drain it and add 1-2 Tbs. of healthy oil per serving at the end for flavor and nutrition. Fresh produce and refrigerated cases are usually around the outer edges of grocery stores. Shop the perimeter to avoid the processed, convenience foods on the middle aisles. Crock-pot cook several servings of your favorite protein source in water at the beginning of the week. Store it, covered in water, in the fridge with a pinch of Vitamin C powder to preserve it. Add your ready-to-go protein to soups, salads, veggie dishes and lunches throughout the week. Eat fresh sprouts – they’re packed with extra vitamins and protein. Try two new (to you), fresh, non-starchy vegetables this week, ones you don’t normally buy. Search for tasty, healthy recipes online. Try a new recipe this week. Take a sheet of paper, and at the top, write Self-Evaluation Chart – Nutrition. Draw a line down the middle to create two columns. At the top of the left-hand column, write My Life-Destroying Choices. What life-destroying choices or habits would you like to change? Write them in that column. Don’t try to list all the life-destroying choices that you’d like to change … just this one area. We’ll address the others, one at a time. At the top of the right-hand column, write My Life-Affirming Choices. What good things do you do in this area of your life, and which new ideas from the lists above resonate with you? Write them on this side. What changes can you make this week to shift your balance sheet in this one area of your life from the Life-Destroying Choices over to the Life-Affirming Choices side? If you make even one or two of those changes every day this week, how might your life change? How did your last week of Empowering the Human Spirit go? Feel free to share your progress (or stumbling blocks) with your fellow Healing Revolutionists on our Facebook page for everyone’s support and benefit. And remember that all stumbling blocks can be turned into stepping stones.